ARCK Boston Blog: Designing and Drawing at GPA! Designing and Drawing at GPA! 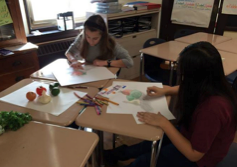 Last month, Mr. Carl’s students had a creative and mathematical lesson at the Gardner Pilot Academy! 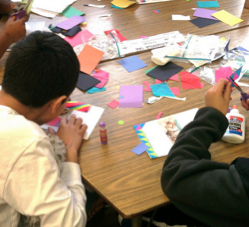 The students worked on a collage project, while learning about fractions, shapes, symmetry, and balance. GPA students used 5 pieces of scrap paper to cut into designs and shapes and glued them onto a larger piece of white paper. They were given a few minutes to get compositional ideas and to trade pieces with their neighbors before finally arranging their chosen papers and gluing them down. The students were encouraged to make a collage that evoked meaning and purpose. Next time, students will bring in their own materials to create a larger, more personal collage. 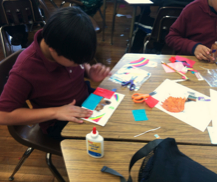 The final collages were colorful and filled with symmetrical and asymmetrical designs. Check out our Flickr and Facebook pages to see more of the great projects our students did during this lesson. We’re so proud of the great work they did! Visit our Facebook and Flickr pages for more images from these wonderful lessons!